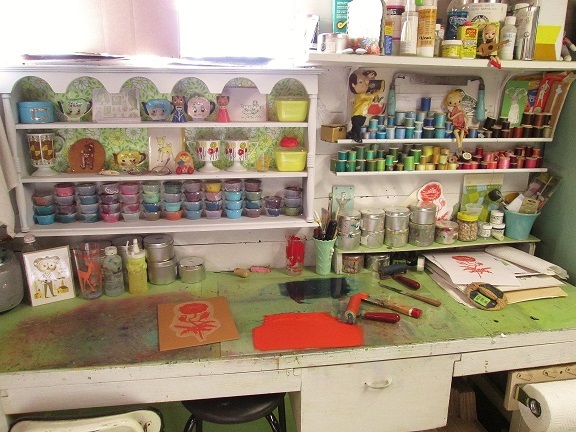 I’ve shown snippets of my studio here and there over the years. Now here’s a closer look into my workspace. I made some changes this Spring adding more shelving and storage, and moved a few things around. I needed to be able to have more artgoodies inventory ready to ship so I had to figure out how to accommodate that. I’d say I’ve just about maxed out my studio. FYI, this is my basement, I love working from home. It doesn’t feel like a basement to me. Welcome to the land of artgoodies. My workbench. 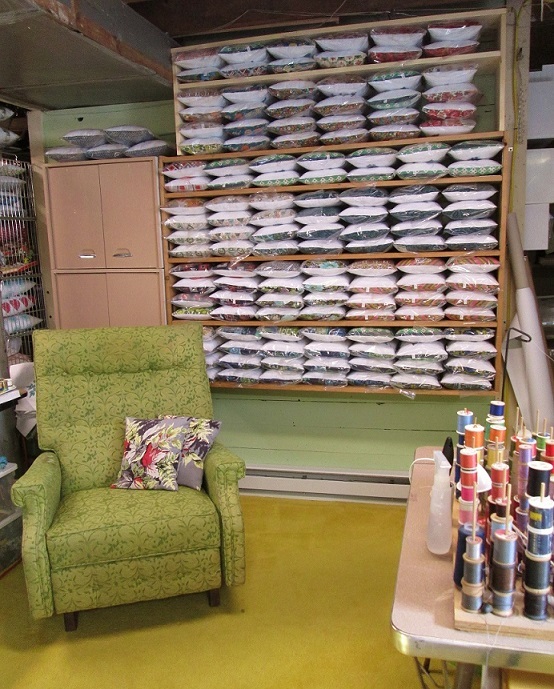 Where I mix ink to print blocks, and some overflow of vintage thread is kept. 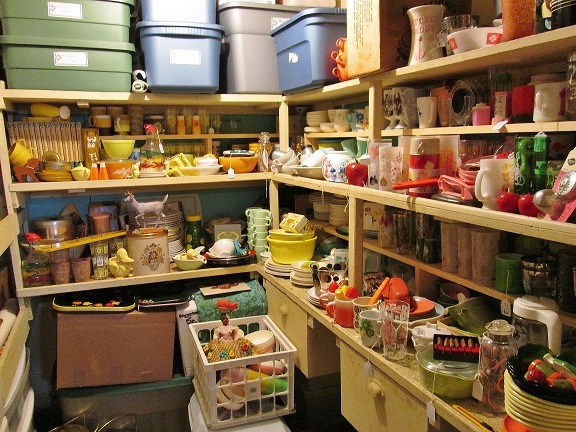 Fun vintage treasures make for colorful little vignettes. Here's my press. This is what I print my blocks on and how the designs you see are created. A fun little cut out window with vintage valance and quarky rooster make it more like home. Plus I can see right into the ironing overstock area! Wall o squillow pillows! My grandma made this shelf back in the day, who knew it would fit so many pillows so well! I had to make an extension to fit more. Cabinets from the original family cottage serve as extra storage and a thrifted recliner gives me a place to rest or work on something comfortably. Grandma's sewing machine, the one I learned to sew on! 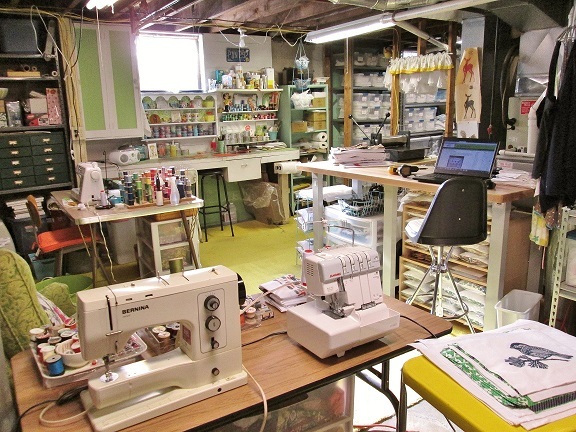 Serger, looking into another part of the studio with another sewing machine, vintage thread, another workstation, and printing press area. Plus look at those squillows hiding under the table. Vintage fabric for miles, work counters, shipping is to the right but I didn't take a pic. 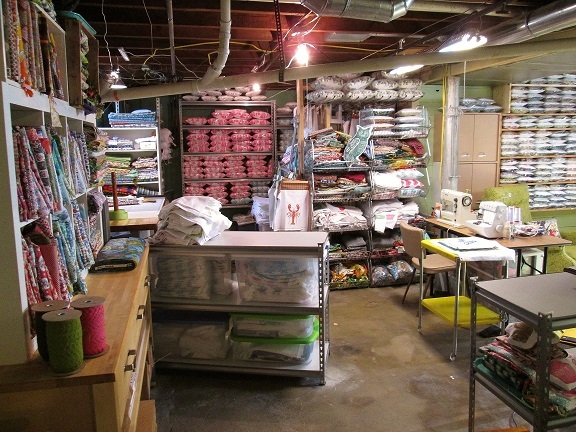 Fabric cutting station at back left, and oodles of ready to ship shams! 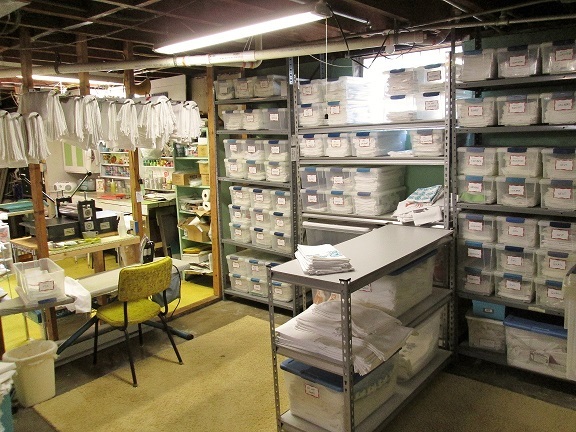 Another view of the ironing/overstock area. 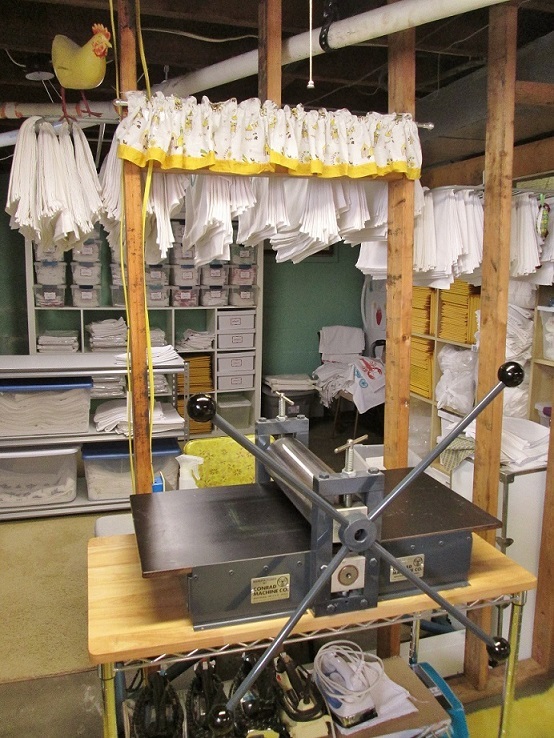 Towels hang above, ready to be ironed and packaged. Plus a vintage iron is the only way to get the job done! 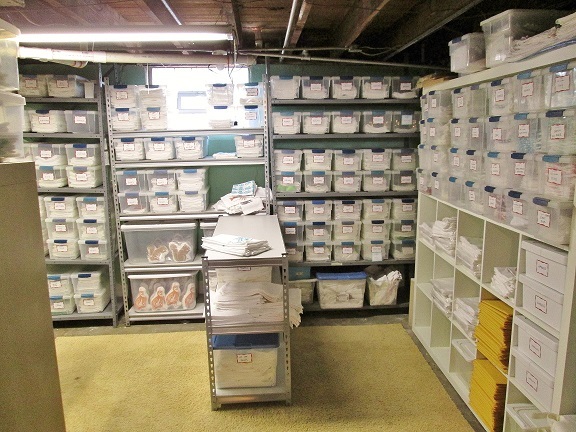 This is my overstock area. Dvd containers serve as the perfectly sized housing for ready to ship towels! Bins are labeled and organized so I can quickly pull orders and also see what I have in stock and what I need to print more of. 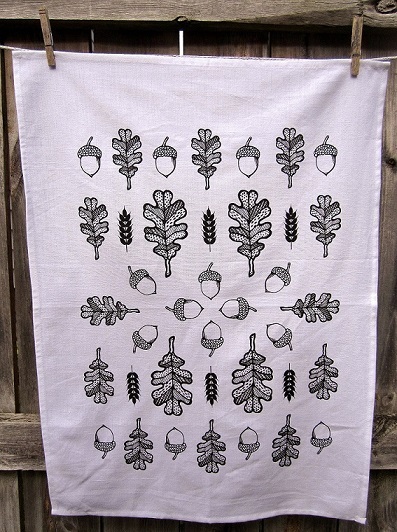 Here are a couple of NEW organic cotton tea towels just for you! 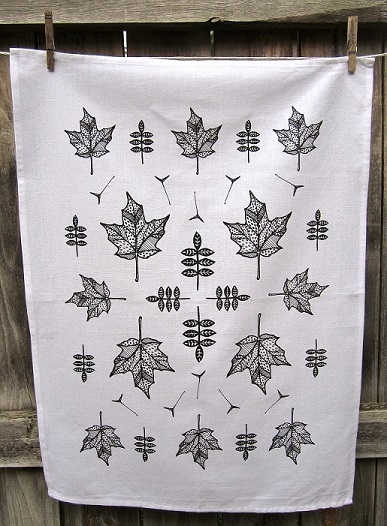 These are my new Sketchbook series leaf towels. Designed from some of my drawings of leaves, a departure from my usual linocut block prints, but they still give you a bold graphic look. It feels great to get back to doing some botanical work! Click on the pics and they’ll take you right to my Etsy shop for more details and they are NOW available for purchase! Time for color of the month July 2013! Cool blues for summer! And might I add, an artgoodies sailboat tea towel would look great with this! Plus makes a wonderful hostess gift if you’re visiting someones cottage this summer! Fave vintage items: little play iron, La France cleaner box-I still have some of this from my grandma's and have to tell you this blue powder can clean! 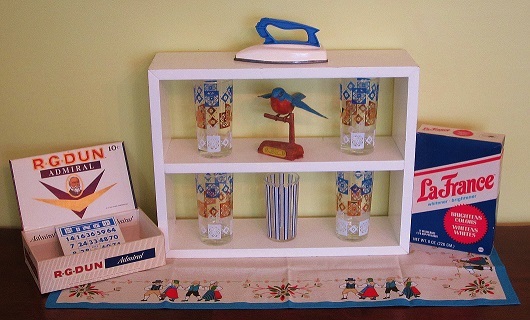 A vintage bluebird plastic model perches next to some fantastic mid century glasses, bingo cards, and a cigar box all sit on top of a cute little vintage runner! 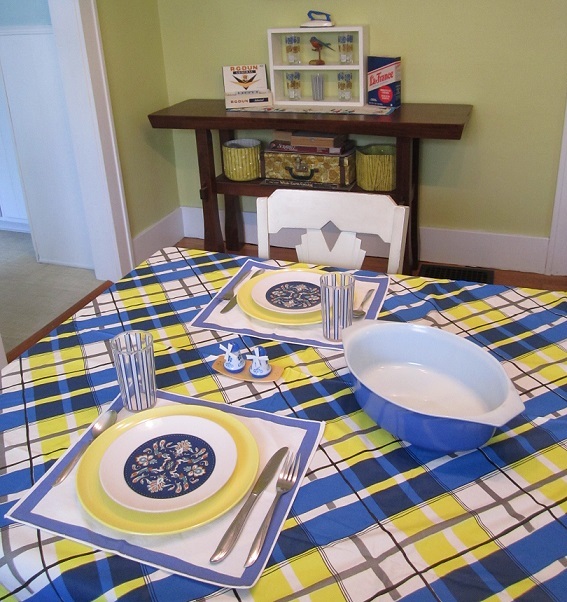 I love this plastic plaid vintage tablecloth! Super bold and fresh! Melmac plates are anchored on blue stripe napkins. Also, blue striped glasses make the grade, plus a big cobalt Pyrex casserole and some little windmill salt and p's finish off the look!